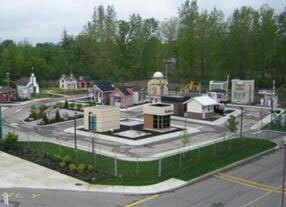 The Brantford Police Service is pleased that the Children’s Safety Village of Brant is one of our community partners. We are proud of our participation in this unique, youth- based, educational centre. Located just down the street from our Station, the Children’s Safety Village is an interactive, hands-on, safety training centre which was spearheaded in our community by the Kiwanis Club. What began as an idea for a millennium project in 1998 came to fruition on two acres of land, at a cost of $1.5 million. The Village opened for business in September 2005 with the official grand opening taking place on May 13, 2006. The Brantford Police Service joined forces with the Brant County OPP, Six Nations Police, along with City, County and Six Nations Fire Departments to provide safety education to grades one to six students in the City and County. 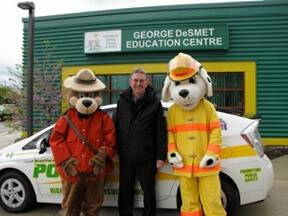 Safety education takes place at the George DeSmet Education Centre, which is 6,000 square feet, with police and fire classrooms, a community room, Smoky’s apartment, offices for police and fire instructors as well as a lunch/volunteer room. Constable Elana Emmons, a 15-year veteran of our Service, teaches safety education at the Village three days a week. Grade one students are taught pedestrian safety, stranger safety and sign recognition. Students are then allowed to practice what they learned in the classroom by driving battery-operated jeeps outdoors. While grade one students receive Constable Emmons’ curriculum, grade twos learn about 9-1-1, smoke detectors, fire escape and hazards in the home from members of the Brantford Fire Department. The next stop on their fire safety itinerary is Sparky’s apartment. Sparky’s apartment simulates hazards found in the home where children can practice an escape plan from a smoke-filled apartment. At the end of the 2009-10 school year, over 30,500 students visited the Village. The Education Centre leads you into the Village square where you’ll find a working traffic light intersection, stop signs, yields and one-way streets. There is also a working railway crossing, complete with a train. Nestled around the Village are miniatures of the Mohawk Chapel, Bell Homestead, Tim Horton’s, Rotary Club, Masonic Lodge, Pioneer Gas, Cooperators, Williamson Group, Cowell Pharmacy, Calbeck’s, the Kiwanis Club and a hydro tower. The Pauline Johnson Amphitheatre is a wonderful setting for outdoor education, and in case the kids get bored, there is a playground climber. The Village also boasts that it’s the only safety village offering a rural component with gravel shoulders and ditches. We hope you will drop by the miniature police station, complete with a jail, which was a joint partnership undertaken by the Brant County OPP, Six Nations Police Service and our Service. The construction committee of the miniature police station gratefully acknowledges the following local companies for their support: J.H. Cohoon Engineering, Eastwind Construction, J & K Grohn Home Building Centre, Master Seal Doors and Windows and Souliere Signs. We are proud of the leadership role taken by members of the Brantford Police Association for dedicating over $30,000 to the Village. To further affirm its dedication to the safety and well- being of children in our community, the Board of the CSV recognizes its partnership with Brantford Power and Mohawk College to turn the Village “green”. 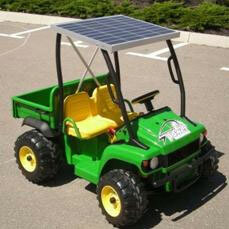 A miniature, solar-powered vehicle, dubbed the “Sun Buggy”, donated by Brantford Power, is now part of the “jeep fleet”. Brantford Power and Mohawk College have now converted all jeep battery charging to solar power. The Children’s Safety Village of Brant is a not-for- profit organization supported financially through community efforts. For those wishing to support the Village with funding or by volunteering, further information can be obtained by contacting the Children’s Safety Village of Brant’s website at www.csvbrant.ca.